Yes, I know, summer is months away. But this time of year can be so grim that we need a little out-of-season eye candy to keep us from wanting to stay in bed all day. 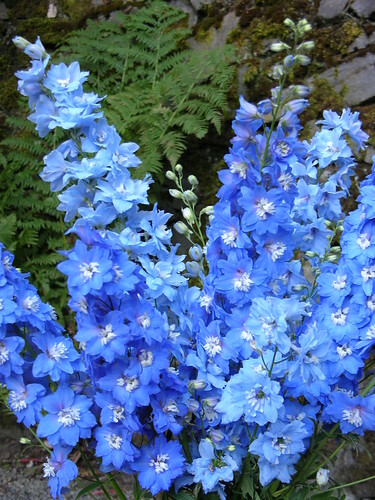 And, as you’ll discover shortly, there’s actually a good reason for talking about delphiniums in the depths of winter. Now, you do have to be careful about how you use them. They look best with other traditional garden plants that have a roughly comparable drama quotient: lilies, hollyhocks, meadow rues, verbascums, roses. That sort of thing. And there’s no getting around the fact that they need rich soil, regular watering, cutting back after the flowers go over, and, in most cases, staking. Yes, I said staking. Just deal with it. That said, you do get your money’s worth with delphiniums, because after they’ve been cut back, following their first flush of high-summer bloom, you’ll get a second display in the fall — but only if you’re a very good gardener and give them enough water and sustenance to produce more leaves and flowers. Also, they’re pretty darned hardy — to at least USDA Zone 3. They thrive in Alaska. Alas, they do not thrive where summers are long, hot, and humid. Sorry, Atlanta, Raleigh, and Charleston. As it turns out, this is the perfect time of year to start delphinium seeds indoors. Why would you do this? (1) Because it’s relatively easy, and (2) you’ll get better, stronger, cheaper plants that way. You can also sample the many wonderful color strains produced by specialist nurseries like Dowdeswell’s Delphiniums in New Zealand. They’re happy to sell you seeds by mail order. Here’s how to do it. Sow about six to a dozen seeds in a four-inch pot filled with standard potting or seed-starting mixture. Keep the soil moist but not soggy, and place the pots few inches beneath a lighting fixture with two 40-watt fluorescent tubes. Keep the tubes on about twelve hours a day. After the seeds have sprouted, thin the seedlings to about three or four per pot. Don’t try to grow them on a windowsill — they won’t get enough sun and they’ll just look spindly and pathetic. Feed the little buggers well (you may need to pot them up individually), and by April or May they’ll be plenty big enough to plant out in the garden. You’ll probably get flowers that very first year. And if all that blueness doesn’t make you swoon, well, maybe you should forget about gardening and take up macramé. Unfortunately, you must also include Philadelphia as an inhospitable habitat for delphiniums. They grow well in Maine though. I tried to subscribe to your blog and got a message that there was no feed. Not sure what to do. Thanks for the comments – I’m not sure why the RSS feed wasn’t working. We’ll look into it. You forgot to mention that the slugs LOVE them too. But, if you’re going to stake you might as well bait while you’re at it. I planted nursery bought Delps, this summer. I staked them and watered them carefully eventhough I had little hope of them growing on the side of our mountain. we have tons of rocks, minimal soil just rocks. Anyhow one died, the other one, after blooming properly, started growing spectacular fronds almost 5 ft high, a very very bushy thi ng. then it had teeny tiny white flowers at the top of the spikes….what the devil could it be. The leaves are proper but that is about all.